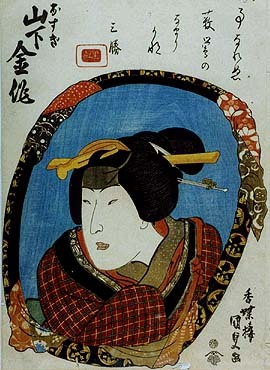 1791 ~ 1830: born in Ôsaka. He started his career as a disciple of the actor Arashi Sangorô III, receiving the name of Arashi Sanzô around 1811. He took the name of Arashi Sankatsu IV at the end of the Bunsei era. He performed in Ôsaka minor theaters (hama shibai). 1830 ~ 1832: his fame as a wakaonnagata actor grew; he notably played the difficult role of Masaoka in the drama "Meiboku Sendai Hagi", which was staged at the Takeda no Shibai. Fall 1832: Sankatsu went to Edo. 11th lunar month of 1832: Arashi Sankatsu IV took the name of Yamashita Kinsaku IV at the Kawarasakiza, performing in the kaomise drama "Tanomiaru Gohiiki no Tsuna". Summer 1833: Kinsaku went back to Kamigata. 6th lunar month of 1835: the play "Sesshû Gappô-ga-Tsuji", which was originally written for the puppet theater and staged in the 2nd lunar month of 1773, was adapted for Kabuki for the first time, in Kyôto at the Kitagawa no Shibai; Kinsaku played the role of Tamate Gozen [casting]. 1st lunar month of 1836: premiere at the Naka no Shibai of Nishizawa Ippô's drama "Hana no Ani Tsubomi no Yatsufusa" Kinsaku played the roles of Hikute and Isarago Gozen [casting]. 6th ~ 9th lunar months of 1839: tour in Nagoya with Nakayama Shinkurô IV and Ogawa Kichitarô III; the troupe performed at the Wakamiya no Shibai. 1st lunar month of 1848: Kinsaku's rank in the Kamigata hyôbanki, wakaonnagata section, was jô-jô-kichi (superior - superior - excellent). He was also the kanjiku for onnagata actors. Spring 1848: tour in Ise. Fall 1848: tour in Nagoya. 9th lunar month of 1849: Kinsaku played at the Wakadayû no Shibai (Ôsaka) the role of Osono in the "Keya-mura" scene of the drama "Hikosan Gongen Chikai no Sukedachi"; the role of Rokusuke was played by Asao Yoroku I. 1st lunar month of 1850: Kinsaku's rank in the Kamigata hyôbanki, wakaonnagata section, was hakushi-jô-jô-kichi (almost unique - superior - superior - excellent). 5th lunar month of 1850: Kinsaku played at the Naka no Shibai the roles of Sagami and Otatsu in the dramas "Ichi-no-Tani Futaba Gunki" and "Natsu Matsuri Naniwa Kagami". 8th lunar month of 1851: Kinsaku played at the Naka no Shibai the role of Ofude in the drama "Hirakana Seisuiki". 11th lunar month of 1851: Kinsaku played in the same theater the role of Koman in the drama "Genpei Nunobiki no Taki". 10th lunar month of 1852: Kinsaku played at the Kado no Shibai the roles of Tsukisayo and the woman Suekiyo in Segawa Jokô III's drama "Kin'u Gyokuto Wakoku no Irifune", which was performed for the first time in Ôsaka. 1st lunar month of 1853: Kinsaku's rank in the Kamigata hyôbanki, wakaonnagata section, was shi-jô-jô-kichi (unique - superior - superior - excellent). He was also the kanjiku for onnagata actors. 3rd lunar month of 1853: Kinsaku achieved a great success at the Kado no Shibai, playing the roles of Okita, Oishi and Ichimonjiya Osai in the classic "Kanadehon Chûshingura"; his stage partners were Ichikawa Ebizô V, Ichikawa Danzô VI, Kataoka Gadô II, Onoe Tamizô II, Nakamura Daikichi III and Asao Tamejûrô IV. 11th lunar month of 1858: Kinsaku appeared on stage for the last time, in Kyôto, at the Kitagawa no Shibai, playing the roles of Kosen and Wakaba-no-Naishi in the drama "Yoshitsune Senbon Zakura". He suddenly fell ill.
23rd day of the 12th lunar month of 1858 : Kinsaku died. The 23rd day of the 12th lunar month of the 5th year of the Ansei era was the 26th of January 1859 in the western calendar.